In the lead up to the Magic Leap One launch, Magic Leap has been coy about what the actual field of view (FoV) is for its first commercial product. Now, a developer noticed that the client-side source code of the FoV documentation (published last month as a placeholder with the just the text "Coming soon on launch day!") already included the final text of the document in a commented-out block of markdown, and has revealed the tightly held mystery. The hidden text lists a horizontal FoV value of 40 degrees, vertical value of 30 degrees, and a diagonal value of 50 degrees, resulting in a 4:3 aspect ratio. Compared to the HoloLens and its 16:9 aspect ratio, the Magic Leap One's FoV is only one-third larger horizontally, but nearly double the vertical value, or approximately 45% bigger overall. Magic Leap also provides some examples for context. At 40-inches, the FoV is sufficient to show a large house cat. At 144-inches, Magic Leap One can display a trio of six-foot-tall people. It appears that Magic Leap will also attempt to coin the term "viewing frustrum" instead of FoV to describe the space in which 3D objects appear, arguing that FoV is better suited describing two-dimensional space. The larger digital FoV, combined with Magic Leap One's circular eyebox design, which occludes the user's peripheral view and, in turn, reduces the natural FoV, Magic Leap should achieve a less jarring effect. The code also leads to the Rain sample experience, where Magic Leap instructs developers on how to employ a vignette technique to enable content to gradually fade in and out at the edges of the FoV, rather than being abruptly cropped off. In layman's terms, think about fading to black at the end of a scene in a movie rather than cutting to black. Since the Magic Leap One renders the color black as invisible, developers can use this to apply a mask to content for custom vignettes. To further assist in this technique, Magic Leap has integrated system-level vignettes for developers to utilize in their apps. The stated FoV ends up being larger than that described by Rolling Stone author Brian Crecente in his hands-on with the device. However, Magic Leap's approach from a hardware and software perspective aligns with Crescente's testimonial that Magic Leap was "working on ways to make that less obvious." So while the Magic Leap One will surpass the first-generation HoloLens in terms of FoV, it may come up far short of other headsets, such as Meta 2, on the market. Moreover, if Microsoft applies its recent research and patents in its next iteration of HoloLens, Magic Leap will have some catching up to do. 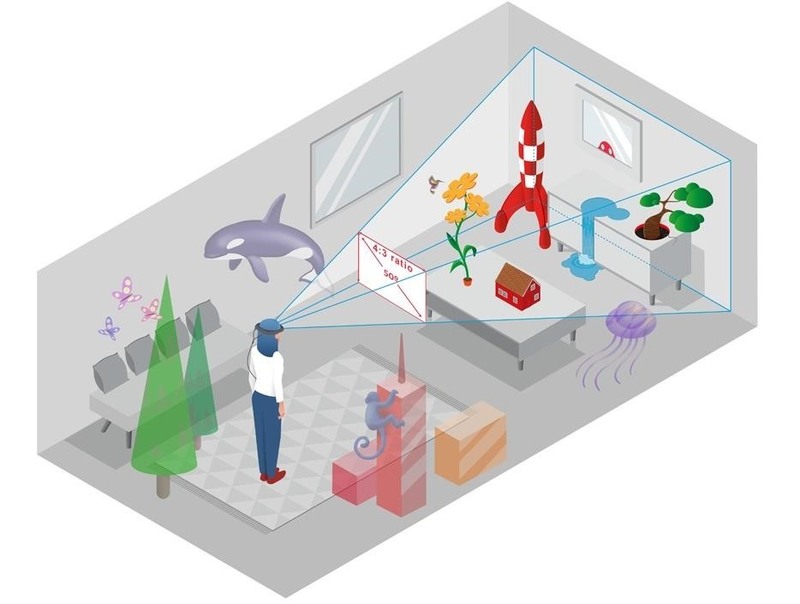 Field of View is widely used in XR to measure the viewable area a person can see through a device like Magic Leap One. 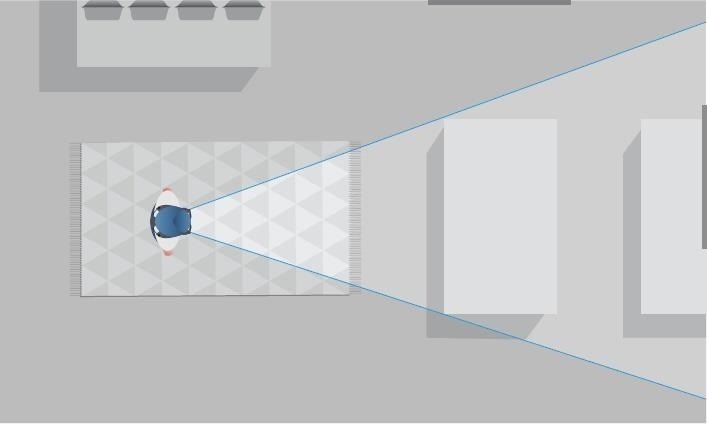 While helpful in providing a baseline measure, Field of View can be misleading as it is a 2D concept and does not fully describe the three-dimensional attributes of space directly visible through our device. A 2D Field of View is a relative measure and is dependent upon the depth and scale of the content being viewed. Instead, the term Viewing Frustum (or View Frustum) better describes the three-dimensional space within which lightfield objects are viewed. With a focus on design guidelines and best practices, our volumes can range from hand sized characters to larger objects like 90" TV screens or even spaceships. Spatial computing is about working in volumes and spaces, not just a 2D Field of View. At 40 inches away a large house cat, laying down (29" long, 21" high) would be fully within the viewing frustum. At 75 inches away a standing large dog such as a labrador or a retriever (54" long, 40" high) would be fully in the viewing frustum. At 110 inches away a 90 inch widescreen TV (80" long, 58" high) would be fully in the viewing frustum. At 144 inches away you can fully fit a family of three 6 foot tall humans, standing upright side by side within the viewing frustum. At 144 inches the viewable area is 104 inches long and 77 inches high. That all said, as a developer you need to know operational values of the device. Magic Leap One has a horizontal FOV of 40 degrees, a vertical FOV of 30 degrees, and a diagonal FOV of 50 degrees. Check out the following documents and samples for more information on ways to work with the device to have larger content, and experiences, that feel good to your users. This is just the latest bit of info to offer yet another hint that the Magic Leap One will soon be available and in the hands of developers who have been waiting years to give Magic Leap's flavor of "spatial computing" a try.